The plethora of online memorial sites has succeeded neither in recreating the calm atmosphere of cemeteries nor in providing us with convincing user benefits even vaguely resembling those of real-world cemeteries. Only very few online cemeteries have realized their natural potential for conserving information about the deceased beyond the minuscule bits of data available on tombstones. 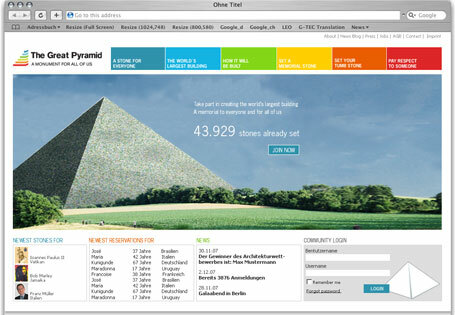 The Great Pyramid Online will be the first online memorial site that will be integrated with the real world. We will be able to 3D-navigate though the structure and explore rich media contents documenting and honoring the achievements and failures of former generations.